Although this book is set in seventeenth century France, it’s easy to forget that it’s actually Victorian literature (and is actually based on a real-life d’Artagnan). 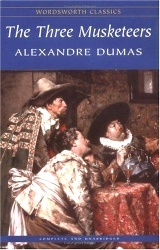 Dumas wrote it as a weekly serial for a newspaper; the translation in the edtion I read – Wordsworth Classics – also dated from the nineteenth century. At first, I found reading The Three Musketeers quite heavy going for the most part. It starts with d’Artagnan travelling up from his home town to Paris where he plans to join the musketeers; he has a letter of introduction from his father to M de Treville, the musketeers’ chief. On the way, at a place called Meung, he picks a fight with a stranger for no particularly good reason; also for no particularly good reason, the stranger takes his letter of introduction once he’s laid d’Artagnan out cold. This theft, however, proves to be of no great consequence, as he manages to get in with Treville with no problem – although he doesn’t have the experience to join the musketeers just yet. The mysterious man whom d’Artagnan fought at Meung seems to have been intended as a mysterious bad guy, but he doesn’t really play much of a part – although he does crop up regularly and becomes something of an ally at the end. He takes second fiddle to Lady de Winter, also known as Milady, who, at towards the end of the book, becomes the central character for several chapters. This episode is not uninteresting, but could have been left out. The introduction to the book describes how Dumas banged out each chapter at a fair lick in order to meet his weekly deadline, and it shows. The plot is meandering, it can be excessively verbose and the characterisation is uneven – the hotheaded d’Artagnan of the early chapters is quickly replaced with a wise and wily fighter. As a novel, it could have done with a lot of rewriting. There is no great poetry of language in the text – indeed, one chapter near the end even begins, ‘It was a dark and stormy night’ – but it’s very direct: everything is either conversation or action (mostly conversation, though). There are some dubious morals on display. Seemingly, if any musketeer sees a man of the cardinal and takes offence, the man’s life is fair game in a duel. D’Artagnan himself all but kills a man he encounters in order to take his papers so he can sail to England. The love interest is a married woman; her husband is a coward who works for the cardinal, so she, too, is fair game. However, it wasn’t terrible, by any means. Although I stopped reading it for a couple of months, when I finally returned to it, I enjoyed it much more. There is a fair amount of humour in it – most notably Athos’s manservant, Grimaud, who is forbidden to speak. The language – while undeniably ersatz, being written two centuries after its setting – has a certain authenticity to it. I even felt a pang of emotion when d’Artagnan mourned his love near the climax. Overall, it was an OK read – not the most classic of classic literature. The Three Musketeers is actually the first in a trilogy, the third book of which is extremely long and often published in three parts, one of which is The Man in the Iron Mask. I may check out Twenty Years After and The Vicomte de Bragelonne at some point.